"Simple and Easy Roast that has become a family favorite. Goes great with a side of mashed potatoes or over rice!" Whisk together the water, Italian dressing mix, ranch dressing mix, and brown gravy mix together in a bowl until smooth. 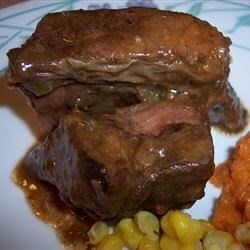 Place the beef roast into a slow cooker, and pour the sauce over top. I made this following recipe exactly and thought it smelled so bad that I wouldn't even eat it. My son tasted it and said it was "ok" but I definitely won't be trying this one again! Couldn't find Italian packet, so substituted 1/2 cup Italian salad dressing and omitted 1/2 cup of the water to compensate... Delish! I will never make slow cooker roast any other way again.